Air New Zealand has called for tougher regulations on drone use after one came within just 5m (16ft) of a plane, narrowly avoiding a "serious incident". The pilots of flight NZ92 from Tokyo spotted the drone as they were coming in to land at Auckland airport on Sunday. 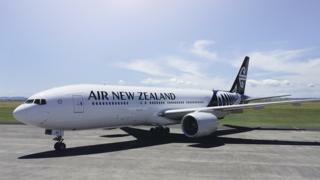 The drone came so close that the crew initially feared it would get sucked into the engine, said Air NZ. The Boeing 777-200 plane and all its 278 passengers were unharmed. It was immediately not clear who was controlling the drone. "NZ92 was just metres away from a serious incident on Sunday," said Air NZ Chief Operations Integrity and Standards Officer Captain David Morgan in a statement. "The pilots spotted the drone at a point in the descent where it was not possible to take evasive action." Mr Morgan said it was clear that "tougher deterrents" were needed to prevent "reckless drone-use around airports", and called for prison terms for drone operators who endangered lives. Under current laws, individual drone operators who breach Civil Aviation Rules can be fined up to NZ$5000 (£2560; $3,600). According to the Civil Aviation Authority of New Zealand, drones are required to be kept at least 4km (2.4 miles) away from any aerodrome. The incident is the second example of reckless drone use this month. Flight operations at Auckland airport were halted for 30 minutes on 6 March after a pilot reported a drone within controlled airspace.